His spurs jangling and his hat tilted low, the cowboy snubbed out his cigarette, adjusted his holster and stepped to the line. He wasted little time. His Winchester rifle flashed, coughing up bitter gun smoke and spitting spent cartridges in a wobbly arc toward the back brim of his hat. He then pumped his shotgun, squeezing out a resonating series of booms and littering the grass with plastic shells. He finished by flashing twin Colt revolvers, drilling his targets in quick succession. Until the dull beep of a palm-size timer signaled the end of this barrage of bullets, it could have been any stock close-up from a silver-screen cowboy serial. But this particular scene, repeated numerous times at Přelouč’s Sportovně střelecký klub shooting range in May, was just a snapshot of members of the Czech Republic’s Asociace westernových střelců (AWS) at a Cowboy Action Shooting event. Part target shooting and part re-enactment, Cowboy Action Shooting (CAS) is an international gun sport wherein participants fire replica weapons and dress in vintage gear. Most days, the 120 or so Czech members of AWS are computer specialists, consultants, truck drivers, police officers or other everyday occupations. But, during select weekends each year, they don vests, boots, leather gear and cowboy hats and become gunslingers known by nicknames like Gatling, Thunderman, Big Bison or Widowmaker. Josef Minhola, a 41-year-old truck driver from south Moravia, thought nothing of driving for hours to join his fellow shooters at Přelouč. He loves Dances With Wolves, and made all of his gear himself, including a pair of leather chaps. Judging by the costumes at the Přelouč event — and an overriding spirit of friendly competition and camaraderie — it’s evident that affinity for the West runs deep. Homemade gun carts were lined up behind the shooting area. Married members Jaroslav “Hogo Fogo” Schiller and his wife, Zuzana “Tornado Lou” Schiller, tied the knot in full Western wear. The jolly Jan “Big Bison” Hlas dressed in a Union soldier’s uniform. Sixteen-year-old crack shot Daniel Šmíd, nicknamed “Blonďák” for his shock of blond hair, is studying to be a gunsmith, and has been shooting with his father, Milan, since he was 11. Both wore matching hats with fake foxtails, one of a few father-son pairs. David “Chico” Martoš, a 38-year-old policeman from Mladá Boleslav, has always loved the way cowboys were heroes fighting against the bad guys. AWS members are serious, orderly and safety-conscious when it comes time to shoot. Groups of shooters go to an area of the shooting range filled with an array of different-sized metal targets. Each participant takes a turn completing what’s called a scenario, or stage. Using a revolver, rifle and shotgun in succession, shooters have to hit targets in a pre-determined sequence, sometimes known by a colorful name like the Nevada Sweep. Often the scenarios incorporate mock western elements: shooting atop a fake horse, drawing oversize playing cards to determine what color target you shoot first or wielding a mock branding iron before drawing your weapon. While one member takes his or her turn, a range officer stands slightly behind holding a timer. Three spotters stand farther back, counting the errant shots (the satisfying clang of a struck metal target isn’t hard to miss). After the last target is hit, the timer stops, misses are tabulated and the results are reported. Before the next shooter begins, there is a pause to reset the course, and the spent cartridges are picked up, since members reload them and sometimes even cast their own bullets to save money. Cowboy Action Shooting started in Coto de Caza, California, in 1981. Inspired by watching westerns, Harper “Judge Roy Bean” Creigh and some fellow shooting enthusiasts started using western-style guns at a range. 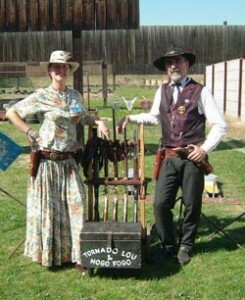 The next year, they organized the inaugural End of Trail event, a themed competition that drew 65 shooters. The concept struck a chord. Boyd A. Davis, part of that founding posse, has witnessed the worldwide growth of the sport firsthand. As Cowboy Action Shooting spread across the United States and the world in the ’80s and various groups formed, a need arose for uniformity and regulation. In 1987, the original Coto de Caza shooters — nicknamed “The Wild Bunch” after the famous Sam Peckinpah Western — formed the Single Action Shooting Society, or SASS, which has become one of the sport’s leading organizations and has more than 82,000 members worldwide. In the Czech Republic, AWS uses SASS rules, and many members are also members of SASS. Some even took trips to the United States to participate in the 2004 annual End of Trail event. SASS has members as far away as Sweden and New Zealand and recently built a new 480-acre (194-hectare) international headquarters in New Mexico, complete with a replica Western town. With a long-running cowboy fascination, Central Europe boasts many homegrown western books and movies, including the Czech film parody Limonádový Joe, set in Stetson City, and the “Red Westerns” of the East German DEFA Film company. The most popular are the Winnetou novels of German writer Karl May, who, despite only visiting the United States once and never going farther than New York City, penned a best-selling series of western stories — many of which have been widely read by AWS members. Afterward, the shooters gathered in the Sportovně střelecký klub bar to award prizes and share a few bottles of non-alcoholic Radegast beer before heading home. Printouts listing the scores were displayed, and the winners received certificates and a small prize, such as sausages or bottles of wine. Talk turned to future summer events (the Czech CAS Championship starts July 3), including the European End of Trail in Italy.